The changing status of my health care forced me to undergo a minor procedure prior to the end of the month, which will cause another set-back in the program. This offers up a few interesting challenges, the primary being that Speedgoat is now less than three months away and I'll probably have no real training for the event until its two months away. Matching last year's effort could be a little tricky. So I've got about a week of nothing, followed by a week of creeping back towards X intensity. Two weeks will require a little planning. In a week off or less you don't actually lose fitness. In fact, you gain fitness as your fast-twitch muscle fibers heal up. This is why athletes taper prior to competition. After a week you need to be careful jumping back into full blown workouts because of this because you do have the ability (with no lost fitness and a full store of fast-twitch and "emergency" muscle fiber to play with) to cause a ridiculous amount of breakdown. Once back in college (before I knew this; or the way I learned it, really) I had a week off and hit the gym. 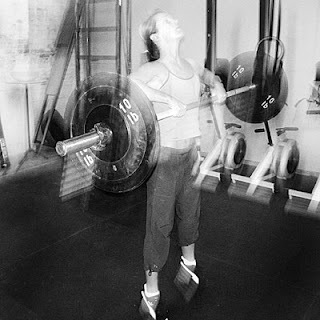 I couldn't believe how strong I felt--one of the exercises I remember doing was calf raises with a full stack and a 200 plus pound guy standing on the bar. I think I broke down every type II a and b (fast twitch) muscle fiber I had. For two weeks I could barely walk around campus and that over-exuberant workout definitely slowed my overall progress a lot more than than the time off. So the rule is that after close to a week off you should begin easing back into things and, certainly, should not be attempting records unless you're in a competition. And, btw, the reason why you don't usually finish a competition totally broken down is that a comp is only about max intensity and not volume, intensity, and progressive overload as a training session would be. Anyways, I don't have that option. After a week I can ease back in depending on how my recovery is going. In general, it takes about as much time as you've had off to get back to where you were. My goal will be to do enough volume of stretching, yoga, and stabilizer muscle exercises that I don't lose much at all. I'm hoping for barely a blip in my overall progress. However, a week lost is still a week lost and it's hard to make up with an event on the calendar. 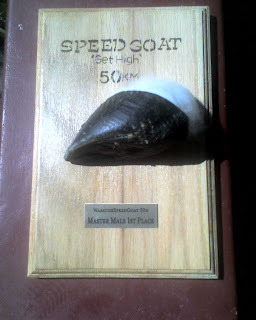 I'm going to be going into Speedgoat so undertrained that most experts would probably advise against it. I look at it as just another physical experiment--another way to alter the template, understand the body, and prove those wrong who dish out words like "impossible". "12" arms don't drop nobody." - a saying used by some of my steroid/bouncer friends in college. I began this program with a shoulder problem that's been around ever since the Hans 50,000 challenge which featured, in part, doing 10,000 push-ups. When I began that contest I could fire off push-ups as if they were nothing. When it ended I was injured and push-ups hurt my left shoulder pretty bad. Dumb? Well, yeah... but whatever. What's life without some silliness? Since that time push-ups have been tough, even though I've fairly thoroughly rehabed my shoulder a couple of times. During my fit test I did a pathetic 30 push-ups. I once could do 100. During my first yoga session every vinyasa hurt like crazy. Now, thanks to S&A I'm feeling better. I've done 30 push-ups during one set of a workout. S&A is not a rehab workout. Not even close. It's a ridiculous assault on some smaller muscles groups, given all those sets, that would make most physical therapists wince. So I was a little surprised that after the first time I did it my shoulder felt better and hurt less during yoga. The second session followed a chest and back workout that had my shoulder feeling tentative by the end. I had a feeling it might help with this and it did. Since that workout my shoulder pain has nearly ceased. Rebabbing shoulders is always tricky and most athletes, especially as they age, have some shoulder issues. Rehab exercises tend to be high volume with very light weight. While essential to improve stabilizer muscle strength they are only part of the solution. In order to fully rehab your shoulders you need to get back to pushing heavy weights too, otherwise your large muscles become out of balance and big full-body movements like push-ups and pull-ups force excessive strain on the area. Since most PTs don't recommened heavy exercise I had to find this out by trial and error. This round is proving my theory correct. I'm guessing that my shoulders will be back close to full strength for the first time in years. We'll see, but basing things on my ability to do push-ups sans pain it certainly seems to be working. I love Tony's intro where he talks about wearing tank tops as if they were invented for guys to show off their biceps. Perhaps this is true but it's also funny as hell. It's certainly true of Hollywood. We've always referred to curls as actor exercises because actors love to show off their arms when they've been in the gym. A no one I can think of moreso than The Shat. The good captain loved wearing tight-fitting clothing when he was in shape. So much so that in one press release my brother and I were reading the main comment for an episode with that Bill had been spending a lot of time in the gym and requested a scene where he take his shirt off. No wonder he got all those women. I'm fairl certain that as soon as he took off his shirt the producers allowed him to improvise his lines as well. "You're too beautiful to ignore. Too much women." Ran into Marc and Suzanne at the dog park yesterday. Suzanne--in week 3--asked "when do you stop being sore?" Sheesh, I dunno. In most programs you adapt within a couple of weeks no matter what because that's how long it takes for your fast-twitch muscles fibers that get blow out in the first few days to fully recovery. The X is slightly different because it changes pace so often that you continually adapt over the first part of the program, meaning that you could stay sore for much longer. And then you factor in workouts where adaptation is just one aspect and trying to master it later on can tear you down even further. Case in point: Chest & Back. Supersetting these two body parts for an hour is rugged. So much so that when I first showed this workout to my friend Bob--a guy who can knock off 60 pull-ups in a row--his comment was "I couldn't finish that". Getting used to it is only step one. Mastering it could take a long time and you'll never do it unless you're in peak condition. Because C&B works two large muscle groups so thoroughly that there’s a huge amount of lactic acid in your system, leading to the feeling like you're about to vomit--or, many times, actually vomiting. When I was in the office I could always tell when someone was really pushing in during C&B because you’d hear them pacing around the office and trying to force enough air into their lungs to flush the lactic acid bath that was attempting to extract their lunch. STEVE EDWARDS, Beachbody’s Director of Results, sits in his office typing on his computer. In the background, we hear a door open punctuated by two men hyperventilating. We hear this sound get louder as one of them approaches STEVE’S office. KIP MARTIN, actor/BB marketing dude/Clark Kent look-alike passes STEVE’S doorway waving his arms in a ballistic stretch referred to as huggers, desperately trying to control his heaving chest. STEVE smiles, knowingly. Chest & Back day, huh? A beat, with more breathing, as KIP moves up and down the hall. He seems to get control of himself, enters STEVE’S office, where he doubles over, hands to knees. KIP shudders somewhat violently, and then moves towards that door. KIP runs out the door towards the men’s room. CLOSE UP: STEVE sitting at his desk, smiling and nodding. 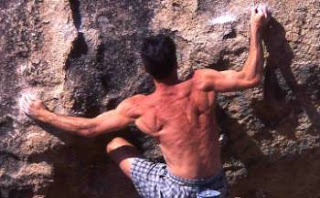 Pic: climbing in Mexico about a decade ago. My back will look like this again soon. This weekend I dropped my application in the mail and am now official entered in something this year. It's one of the most difficult races on the ultra calendar. While short, for an ultra, it's the most difficult course profile there is--last year it had over 24,000' of elevation change in just under 30 miles. Here's my race report. This should be an interesting experiment. 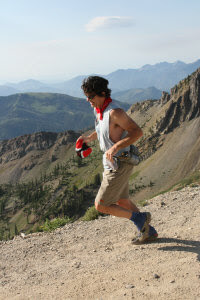 Last year I'd been doing a lot of running--well, run, hike, long mountain adventures anyway. This year I've done almost none. Not a single "run". Quite a few dog hikes. Not one long day in the mountains. I have almost exactly three months to train. My training will start slow. Like I stated earlier in this program I don't always heed my own advice. Here's an old post from a runner doing Power 90. I tell him to stop running for a while. He reluctantly does and his times improve when he starts again. As for me, my legs are feeling good and I don't want to slow this progress. So I'm going to resist the temptation to start pounding right away and ease into this slowly so this will also serve as a "Running and P90X" example. I'm easing into the diet too (I always eat okay, btw). When are we getting those beers? I get asked questions all the time about how to get back on a program when you've missed some days. The answer is always different but the one thing it generally has in common is not to overdo it trying to get back in a hurry. Of course, I don't always listen to my own advice. I've missed the last 5 days of training because I've been moving, cleaning, getting my old house ready to rent, keeping up on work, trying to keep the dogs' legs stetched, etc. It doesn't feel like I haven't been training because I'm more tired than I was before it started. Still, fitness feels like it's slipping 'causing me to tell Reed that I'm thinking of doing double days to catch up. "Didn't I read that if you miss a few days you should not try and catch up but just pick up the program as if you hadn't missed any workouts," he said knowing that I'd written it in the guide. Right, I should take my own advice sometime. So in deciding that I'll listen to myself I'm jumping right back in. What I will change is that I'll consider this week a bit of a recovery week (though I don't feel very recovered at all) and go for three hard weeks before my next transition week. The transition (or recovery as they're called) weeks in P90X can always be altered a bit because the adaptive and growth phase of each block might take anywhere between 3 and about 6 or 7 weeks depending on one's fitness state and the intensity of each workout. Since 90X was meant to be extreme we kept the blocks short. People not in peak fitness could extend them until they begin to plateau. I have no risk of plateau-ing any time soon. Right now it's all about adaptation. It seems pathetic that I'm more sore after yoga than any other workout. I've done yoga, off and on, for more than 20 years but never enough to get good at it. This round I'm coming off as long a break as ever and it's silly just how bad I am. I mean, it's great, too. During every session I ask myself why ever don't do yoga because it feels so good. A also tell myself it's hard and that I'll never get any good at it. My main problem is that it's boring. I'd rather be outside climbing, riding, exploring. But yoga makes those things easier, so I'm pretty committed to getting on a more regular schedule. Day two and I've already made progress but have a long long way to go. It's not exactly an excuse but I find myself falling out of postures because I'll laugh. Not at the dvd, but at the recollection of Tony's test group sessions. Tony loves yoga, does it religiously, and is a good teacher. But he also played football and enjoys competition. He can't help this from coming through in his style. In the final vidoes we edited him a bit and he also knew to tone it done on camera--still, he can't help using words like "fight" that you don't normally associate with yoga. With the test group, however, yogi Tony was more like drill instructor Tony. Some of the original test group yoga sessions were like a skit on SNL. "Cohen, you miserable piece of @#%! 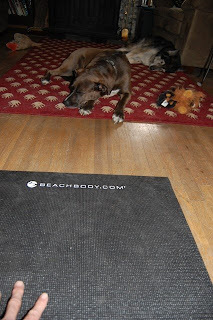 You call that a @#$%*-ing downward dog?!" is one of my favorites but there were plenty of them. I would usually do the original workouts right after they'd film them and we'd make adjustments as necessary. The only adjustments to the yoga routine that I vividly recall is the elimination of stuff that had me laughing most of the way through it. I once told Tony we should consider a yoga studio aimed at a male audience. Instead of peace and mediation we'd get aggro, berate clients, kick them out of class for performing poorly... like real sports. Why is this funny? I love ironic behavior, especially in an extreme sense. Some of my favorite coaches were the ones that could balance teaching with crazy behavior, like Bobby Knight and, unfortunately, they're being weeded out in our politically correct society. I learned a lot playing for people like this. It's not fun when you're the one being targeted but you always knew that it wasn't personal--just your turn. One of my favorite examples is from coach Maz at Mt.SAC. He'd had enough of one player, calls timeout, and runs onto the field screming, "...you're fat. You're fat, and you're slow. You're fat, you're slow (a beat), and you're a disgrace to baseball! Get off the field!" He then follows him to the dugout kicking dirt at him like Billy Martin used to do to umpires before that, too, was declared poor form. I miss that stuff. It gave the games personality. I guess I'm like Paul Newman's character in Slap Shot when he's screaming at the ref for calling a penalty, "what are you running here, a goddamned dance floor? This is hockey!" Anyways, that guy wasn't really fat. He was a college athlete. I'm not fat either. But that doesn't stop the screaming in my head as I'm falling out of Warrior III from blaring, "Edwards, you're fat. You're fat, and you have no balance. You're fat, lack balance, and are a disgrace to yoga. Get off the mat!" pic: the kids in their favorite pose: savasana. Romney took her fit test last night and if I posted a before pic she'd kill me (posting one anyway that I'm gambling she won't kill me for--snatching with the Joneses). However, she looks fine and, as you'll see, isn't all that un-fit. Still, we expect some improvement. She won't be doing X but filling X workouts in around her Gym Jones sessions (not exactly a drop-off in intensity--check their site), which are going to focus on rehabbing some knee issue that we really need to MRI but don't have the excess money to pay her current deductable b/c we just bought a new house, etc (insert insurance rant here). HR: 155, 120, 80(? ), 80(? )- we (again) didn't use a monitor so this will be more accurate later on. Scott didn't send his but he looks thin and I'm sure his improvements will be mainly performance based. measurements: we're big where we shouldn't be and small where we shouldn't be. fat calipers: utilizing visual analysis and poking and pinching, it's clear that we're gooey! before pics: would be an afront to god and all others who would lay eyes upon them. more like 2 times every six months) and we walk the dogs at red butte or tanner every day for an hour (we haven't slacked here, but this is the first time in my life i would consider it exercise). so that's it for now, we're depressed, going into work and then taking the dogs out and then not eating a lot of thai food! thanks for the motivation and good luck with the move and your program. wait, tomorrow is chest and back, ab ripper x. Doing these videos again has reminded me of our test group. No matter how fit you are, 90x will find your weakness and exploit it. We auditioned pretty much every hot shot fitness person and trainer in LA and ended up casting either Tony's friends (who train with him regularly) or members of our test group who up until that time had little fitness training. It was a great testament to how the X works. Tony and I were talking about this as one "famous" trainer and another was getting out performed by some regular Joe whose only advantage was that they'd just finished three months of the program they were auditioning for, "It takes you out of your wheelhouse and exploits your weaknesses, no matter who you are," he said. I should add that I auditioned too and was one of the latter, which I only did because Tony asked me to. But when my time came around I was in the midst of week 2 and so sore that I could barely wash my hair, much less ace a fit test. I was in such a state of breakdown that I had no clue how long it would last. 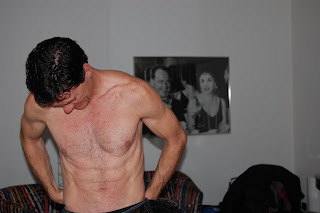 I was fit; having just finished a full bike racing/multi-sport season. But fit meant nothing. I was out of my wheelhouse and so sore that I could barely walk. "You gonna be ready in a few weeks?" Tony asked. "I have no idea," was my reply. "We should just cast test group people." I did get better. A couple of months later I did one of my hardest birthday challenges that combined my usual endurance activity with heaps of pull-ups, push-ups, and other assorted anaerobic stuff. The X was perfect training for it. Our little test group is filled with athletes. It's going to be fun to see how we come out of it. Marc and Suzanne are climbers (though Marc claims he's finished with it; Suzanne is still climbing very hard) and Marc is a cyclist. Reed is one of my closest friends, an ex-climber who pretty much now just rides his bike. Sk-hawt is an ex-national level cyclist. Romney is going to join in at some point in some way, most likely with a combination of X and Gym Jones. Another Jonesian, Erica, just broke her leg skiing and may join us during her rehab phase. Lisa's friends Dan and Elizabeth may also join the thread. On my suggestion they started a month ago, are now in tip top form, and "Tony Horton fanatics". Dan is another ex-climber who is talking about starting again and Elizabeth "can see back muscle for the first time in my life." 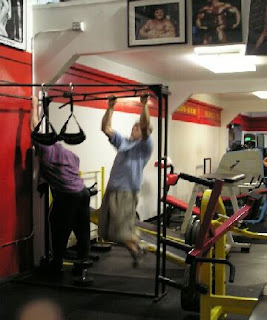 above pic: on my way to 430 pull-ups at Gold's Gym in Venice, just a sliver of the agenda of Challenge 03. This workout reminds me of basketball practice. Since I haven't practiced basketball since, like, college it stands to reason that I'm pretty sore this morning. I actually did quite well. I was dizzy a few times but not alarmingly so and kept up with everyone, which I can't say for any of the other workouts yet. I even thought, for a minute post-workout, that I might not be too sore but later on in the evening I began feeling heavy and getting out of bed this morning wasn't particularly easy. Paying dues is always fun. I had a couple of thoughts during my session. 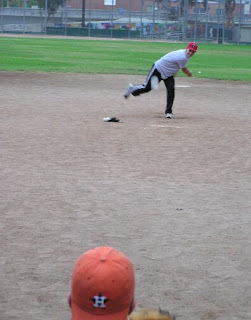 First was that maybe this is why I added both a basketball and baseball element to my challenge in 03. I mean, I played baseball for many years, and even in college, but never really liked it that much. But it's always nice to see that you still have it to some degree and those pitching movements probably got me thinking of that. I also thought of Leigh Miller who used to work at Beachbody. He was similar to me in that he had a lot of oddly varying interests that didn't seem to relate to each other, which meant that we related very well. We did a lot of the 90x workouts to test them as they were being designed, including Plyo for the first time. We hadn't shot any video so we'd do them off of Tony's proposed work sheets and had to try and figure out each move. We didn't always get them right and often made the workouts even harder. He also had this really cool and funny picture on his desk of he and his fiance that was similar to this pic of my wife and I. I thought the pic showed a special connection between them and was envious he'd found someone like that. I know it shows a special connection between us; and now I know that I was right to be envious. I haven't heard from Leigh in a while but am sure he's doing great. He's the type who will always do great. Anyways, I love Tony's introduction to Plyo where he distills the meaning of plyometric exercise into "jumping." Well, yeah. But a slightly more scientific reason of why plyometric training is helpful is that it eccentrically forces the stretching of a muscle prior to its concentric action. This action causes is high level of muscle cell motor unit recruitment. This recruitment action is what determinds a muscle's effeciency, or the absolute strength of a given muscle, and is absolutely vital for sports performance. Without any type of plyometric training it's impossible to reach your body's potential for performance. Week 1 is finished. As I stated, it was a transition week and not really a week of X. I'm sore. Really sore. Christ, I was sore after yoga. It's not too surprising given that I have a fair amount of fast-twitch muscle fiber which breaks down quickly and recovers slowly. I knew I'd be sore but still...and with Chest/Back on the horizon, followed by Plyo, it's going to get a lot worse before it gets better. On the positive side having done the workouts before I'm adapting pretty quickly. Also, I'd never done the final 90x dvds as I'd always worked off of my demo tapes from the test group. The final workouts are better but also just a bit easier because we've perfected the pauses between sets. The original test group was four people, which myself or Mason on occasional fifth. Tony would go at the pace of the group and we later figured, after the large test group, what the best rest for everyone would be. Anyway, this helped me adapt quicker, use better form, and will lead to more rapid improvement. Once you get good you can always go faster, so the slower pace is generally better. Marc and Suzanne just mailed in their fit test stats. Reed is still in Hawaii but gets back today, I think. Romney wants in, too, at least in combo with her Gym Jones stuff. With Sk-hawt also beginning, looks like our party is now 6 strong. No problem with that. The title is a reference to one of Tony's lines in Power 90. We make fun of him--can't take this all too serious can we?--whenever possible, all in good fun. My brother was the first to bring that line up because he says it at one of the few times nothing is really going on, which, for some reason, has amused me and my friends greatly over the years so much that we use this line constantly when nothing is going on. I'll use more of these throughout this program when I have nothing else to write about. However, it's not all that appropriate right now because I'm awfully sore and stiff and something is, indeed, startin' to happen. April is going to be a busy month. We're moving, which also involves getting both of our houses ready for rent and renting mine (Romney's is rented). This act involves purging a lot of stuff, purchasing some new stuff, and lots of yard work. Tuco's a little bitter about our lack of outside time but at least we're moving right next to the "best dog park in the Western US", which puts it in the running for best dog park worldwide, which is actually just an open space area with my wife to thank for the access (one of her gigs as the mayor's environmental advisor). Anyways, my point of the qualifier is that I'm only designing the first block of 90X to get me through the transitory month. Like I said yesterday, we're starting off with a transition week. Then we get down to business--though, as Xers know, transition/recovery weeks often seem harder than the business weeks. The only goal this month is to finish it. Baby steps. You may notice a switch back and forth between the Classic and Lean routines. This is to give a few atrophied areas (I lost a lot of muscle in India) a bit more recovery time and also put less strain on connective tissues. This is not the best plan for a grow curve if I were fit but it's a good compromise. I will also, most certainly, be doing some riding, running, and climbing as well which has been considered when planning for breakdown/recovery factor. Training beyond your ability to recover is silly, not to mention un-productive. So my day 1 P90X workout was... The UML! I know, it's a Master Series workout but I'm waiting for my friends, who can't start til next week, plus I'm still sore from the Fit Test. The UML was enough. In fact, the entire first week is going to be a transition week much like the recover weeks during the program. I'll get less sore this way and be able to go harder when I hit things like Chest and Back. Christ, I didn't make it through all of the UML moves without stopping. Pathetic. Still working on the schedule. It will be ammended anyway but I'm mainly having trouble because I just don't know what I'm training for. Got an email from my friend Mike who signed up for some weird hike, ski, run, ride, kayak race because he needs "an eye opener" in order to get focused. I generally work like this, too. I just need to find something that I really want to do. General bike racing, running races, or climbing aren't holding much interest at the moment. I'm thinking some speed ascents in the mountains may be in order. Anyway, I'm uber busy for the next month so I've got some forced time to mull it over. My before pic was taken last week by my wife in Zurich. It hides how un-fit I actually am. And that's right, I said wife. The girl whom was until now--and still for that matter--is most often referred to as Romney on this blog. We eloped in Switzerland last week-ish (actual date the spring equinox) and have been letting the news trickle out. Having never been married, or even engaged, I can't say it's a shock. It feels perfectly natural, which I'm sure is all due to her. Back with my 90X training schedule tomorrow.